I can easily distinguish Christmas music when flipping through the radio stations. I don't know what makes Christmas music so easily identifiable. Maybe it’s the jingle bell accompaniment that seems to be a mainstay in the holiday music world. Maybe it’s the somewhat hokey quality of the song. Maybe it’s the joy that I hear in the singer’s voice. I just know that it takes about 2 seconds to register in my brain as "Christmas music". Just as distinguishing sounds in music, makes our car ride more enjoyable. Distinguishing sounds in language makes early reading more enjoyable. The ability to hear and manipulate oral language sounds is termed “phonological awareness.” The abilities to hear rhyming words, clap syllables, and recognize words that sound the same in parts are included in phonological awareness. The ability to hear all of the individual sounds in words is called phonemic awareness. For instance, if you can hear all of the individual sounds in c-a-t then you can hear each individual phoneme. This month we’re going to be talking about the Sounds of the Season on Ready. Set. Read! I will be sharing some resources, fun games, silly songs, and wonderful books for strengthening your child’s phonological awareness. 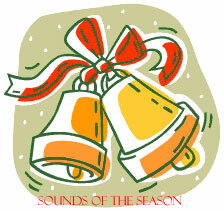 Since Christmas music is pretty much my fav music of all, I’ll also be featuring songs of the season. I’ve even talked a few elementary music teachery girls to guest blog on their favorite music picks for kids. It’s going to be an exciting month at RSR. I hope you’ll come back and join me! How do you foster phonological awareness in your child or in your students? We do a lot with rhyming in the car. I want JDaniel to hear what the sounds have in common. I am nervous about the removal of Christmas decorations by a certain toddler too. Just found you through Bloggy Moms, so now following! I'm an avid reader and I really push reading on my kids. Sometimes I think too much. My son is 10 and enjoys it but never sticks to finishing one book. He has about 6 started next to his bed. My daughter is six and has a harder time reading. Most of the time she guesses and we both get frustrated. She is in a reading program at school. She can do it, shes just stubborn and if she doesn't want to she won't. I'm sure eventually she will take off like a kite! Following your blog now...popped by from Mommy Moment. We do several activities within the scope of our homeschool morning to develop phonological awareness, but look forward to perusing your blog to see what neat things you do too. OK...so if I'm reading this right, the fact that Kellen has chosen to learn "Feliz Navidad" first, even though we don't speak Spanish, is still good...because it is fostering phonological awareness. Muy bueno!